Sleeping like a king is the start of living like a king. And sleep-happy bed linen is a matter of choice rather than accident. Although, Nimish Shah’s label, Shift, venturing into bed linen is a matter of what he calls, “a beautiful accident.” Having launched a capsule collection of quilts with luxury décor store Good Earth, his brand encapsulates the minimal chic which is at once cool but also luxe in its use of organic only material. And with this one we have an example of a homegrown brand venturing into concept bed furnishings which is one of the hottest trends in the larger category of home décor. Boutique brands like Safomasi are also doing limited edition, thematic collections with rich illustrations and soft, superior fabric which is supposed to not only grace your room with art-inspired linen but also let you sleep well tucked into breathable ‘bed couture’. No more assembly line prints on run-of-the-mill cotton, but more sophisticated, coordinated, luxurious bedding. And no, you don’t need to be getting married to lay claim to these! Keeping in line with this trend being all the rage, Hugo Boss in fact launched a line just last year dedicated to bedding at the Boss Lounge in Mumbai. The BOSS bed carries a bespoke concept with monogrammed bed linen. According to Siddharth Palawat, owner Textorium, “While a lot of bed linen and work has traditionally happened in India even for the international market, it is only now that we have gone from exporting to paying attention to the Indian market”. Textorium is a 50-year-old heritage boutique in Jaipur that has a slew of esteemed clientele, such as, the Ambanis, Singhanias, Birlas and even Prince Charles. They are known for their Mughal bedding line, which comprises of extra soft quilts that carry hand block print on silk. They are so confident of the way the fabric has been treated, that they assure even a machine wash would not spoil the quality of the quilt. 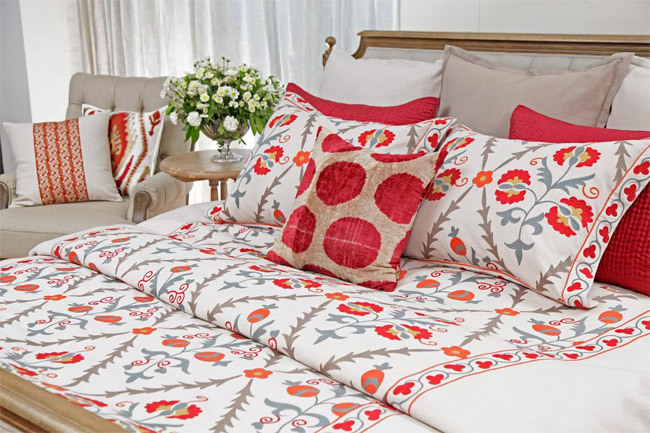 Shades of India is another brand that was until recently creating exquisite bedding more focused towards the International market. Now some of their prestigious projects include the Rashtrapati Bhavan, the Magnolias, and luxury residences in metropolitan cities. While they were putting to use the workmanship of traditional artisans, they were creating bed sets for stores abroad. They were the first from India to get an award at the Maison et Objet in Paris. Design Director Mandeep Negi says, “Our brand redefines Indian aesthetics, which in turn makes for a growing base of customers on home soil as well as internationally. We now do less of patterns and more of texturing as it carries an international appeal that cuts across borders.” She is also very fond of using contrasting colours such as red with limp grey for a harmonious look that appeals to the discerning Indian client. 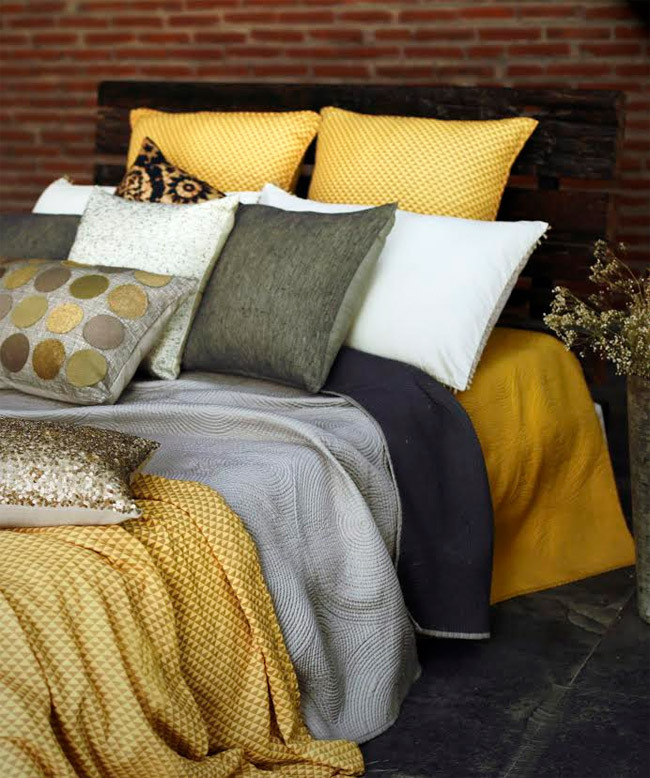 The well established name Sarita Handa, is eponymous with lifestyle bedding. Her Luxury bedding line is inspired from scroll patterns of chateau gates, embroideries done by nuns in a French convent and antique laces that bring back a forgotten period that spelled elegance. The company’s design and manufacturing arm has been selling to major retailers around the world; Pottery Barn, Macy’s, Zara Home and Bloomingdales to name a few. Today, they have two stores in India and available through one shop in shop and online platforms. The bed linen comprising of draperies and upholsteries, is priced up to Rs 25,000. “As a designer we ensure that the Indian needlework is balanced with contemporary designs and has global appeal. India is a land rich in textiles and craftsmen. Promoting the hand of the artisan but with a global sense can do wonders for this market. We need to move away from ethnic and create newer designs elements,” says Sarita. And that is just what Wendell Rodricks aspired to do as he has designed a special luxury line for New York headquartered international brand Portico, that has now been in India for few years. “The world today loves the idea of a simplistic home, and the same applies to bedding as well! My inspiration comes from the idea of making this world a simpler place to live in. Therefore the collection represents the objective of a minimalistic home, with motifs that are simple and uncluttered. There is usage of whites to enhance its elegance and make the bed easy to accessorize! The colors used are subtle with printed sheets and solid colored pillows which provide a crisp and an effortless serenity to any room,” says Wendell. With all the refinement happening, can the mattress be left behind. It is too becoming a specialized space. A Bangalore based mattress brand Sunday brings attention to detail, enhancing the experience. Designed by an acclaimed Japanese designer, Hiroko Shiratori, the look is a blend of simplicity and elegance, and the pillows come paired with the mattresses, remodeling the way we viewed mattresses thus far. Founder Alphonse Reddy says, “We spent almost 12 months in the development of our mattress and pillow. We are the first Indian company to offer mattress and pillow pairing and offer cent percent latex in keeping with European standards.” The mattresses come in just two variants- Sunday Ortho Plus which is relatively firm and meant for older people and those with back problems, and Sunday Latex plus, a softer version for the urban young. The pillows have been designed according to the mattress type and whether one is a side sleeper or a back sleeper. The ‘delight pillows’ are made of very fine microfiber and there is a ‘Sunday topper’ for those who want to make their mattress softer and a ‘Sunday protector pad’ for those who want to make their mattress last longer. Bedding is slowly moving away from ‘a basic need’ to a work of art and why not, a room and especially your bed is a reflection of your dreams, your lifestyle and of yourself.